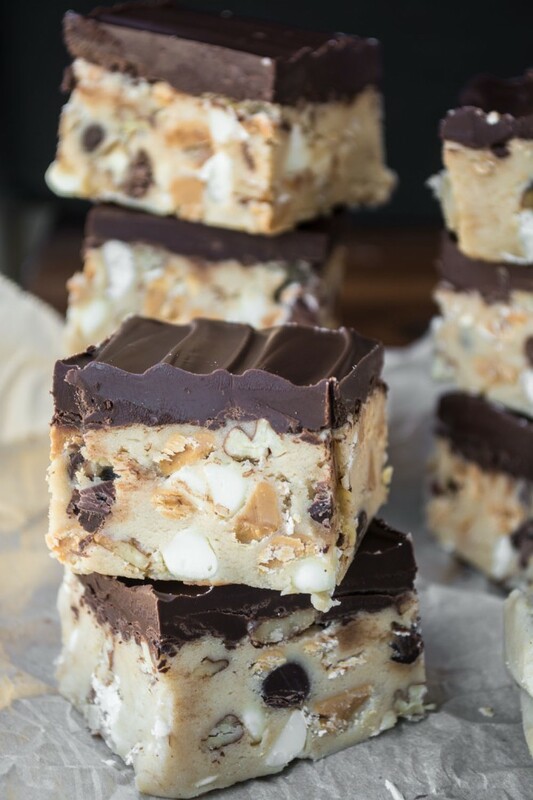 I Want To Marry You Cookie Dough Bars are chocked full of chocolate chips, white chocolate chips, peanut butter chips, oats, and pecans. There’s a little bit of everything in there, no wonder people tend to get romantic around them. 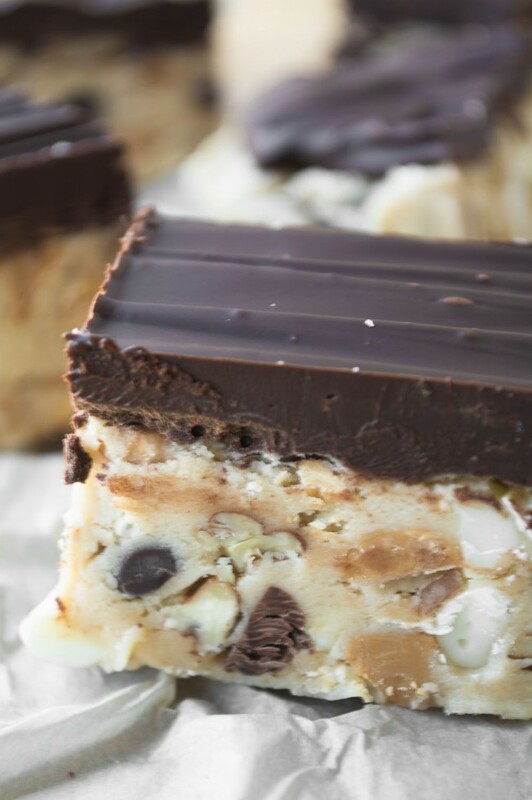 My CHOCOLATE CHIP COOKIE DOUGH BARS were so popular I couldn’t help but dream up variations…I have an obsessive brain like that. These I Want To Marry You Cookie Dough Bars are every bit as good, if not better than the first. Grabbing tastes of regular raw cookie dough is so tempting, and so not smart. Raw eggs can be dangerous. This fun work around ditches the egg but keeps all the flavor. Since they’re no-bake, they are particularly suited to warm weather. Store them in the fridge and they’ll be ready when the urge strikes. When you slice these — in very small pieces, please — you’ll see all the bits and pieces and make them so irresistible. They have a soft fudge-like texture, and a little goes a long way. TIP: Concerned about eating raw flour? 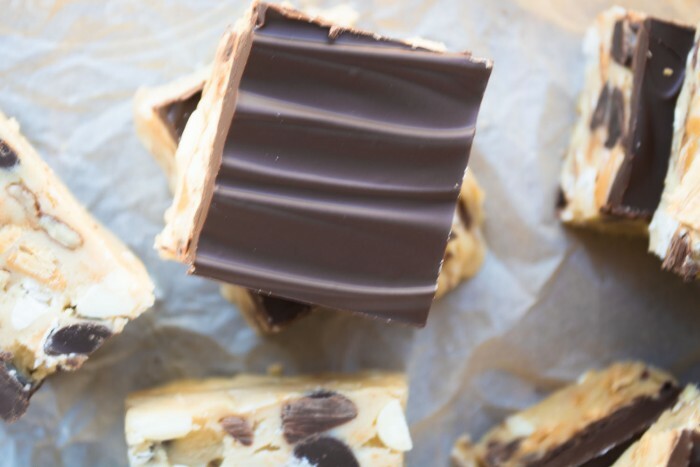 Check out my NO BAKE PEANUT BUTTER CHOCOLATE CHIP COOKIE DOUGH BARS where I show you how to pasteurize your own flour to make it safer. Cream the butter with the brown sugar until light and fluffy. Beat in the oats, vanilla and cinnamon. Add the flour and the condensed milk alternately with each other, beginning and ending with dry ingredients. Don't drain the can of condensed milk to the last drop, you may not need quite all of it. Fold in the chips and the nuts until well combined. To make the topping put the chocolate chips in a 2 cup Pyrex measuring cup or other microwave safe bowl. Microwave for 1 minute, and then stir until completely melted and smooth. Zap for another 10-15 seconds if necessary. Let cool slightly. Pour the melted chocolate over the dough and spread out evenly. Put back in the fridge until firm, about an hour. Slice the dough into small squares with a sharp knife. I let the pan sit out for a few minutes so the chocolate topping has a chance to soften a bit. Keep chilled. Use your favorite gluten free flour mix to make these gluten free. 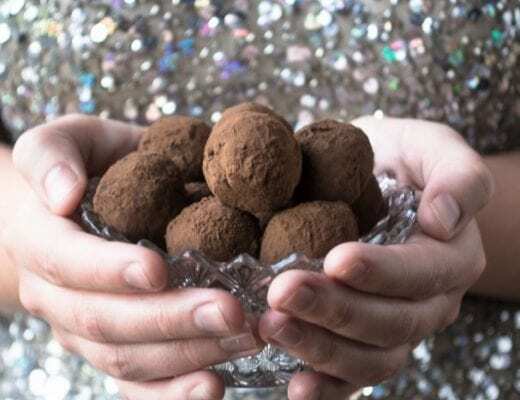 Make cookie dough truffles by forming the dough into small balls, chilling them, and then dipping into the melted chocolate topping. Set on parchment paper and then chill until ready to eat. 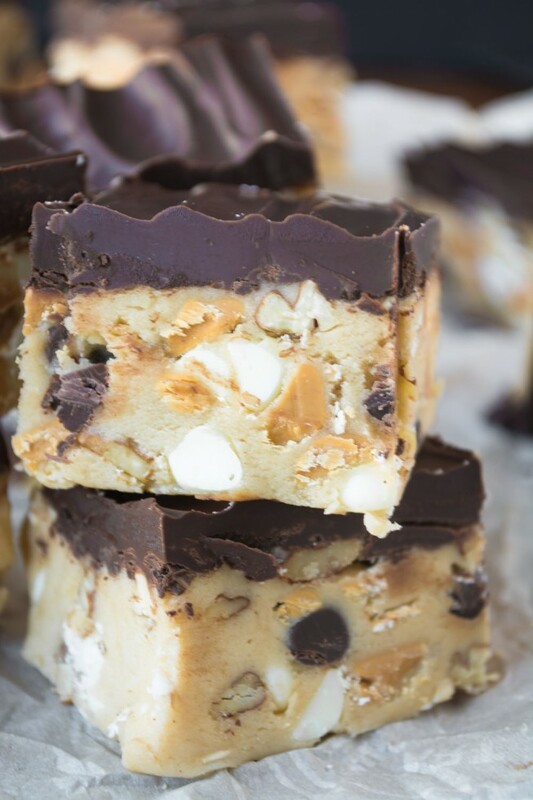 don’t forget to pin these I Want to Marry You Cookie Dough Bars! These cookies were delicious! Thank you for the recipe. Looked fantastic but were hard to mix up and very crumbly when finished. Chocolate top also looked nothing like yours in the photo and was very gritty. Not sure what happened but I wasn’t a fan. Ended up dumping the whole mess in the trash when all said and done. Still interested in trying other things here though. Do you think I could make oat flour in my food processor and substitute that for the other flour? I don’t think oat flour would hold together well enough, Heather, but since I haven’t tested it, I can’t say for sure, sorry. A bit too sweet. I paired it with some pretzels and it was better. I’d add a pretzel bottom next time. These look amazing and I want to make them today but am concerned about a raw flour taste since they are no-bake. Has anyone experienced raw flour taste? Thanks! These bars look amazing, Sue! I love this idea and I especially love the idea of cutting them small and serving them like fudge. Why must you live so far away? I would love to share a plate of these beauties over coffee! 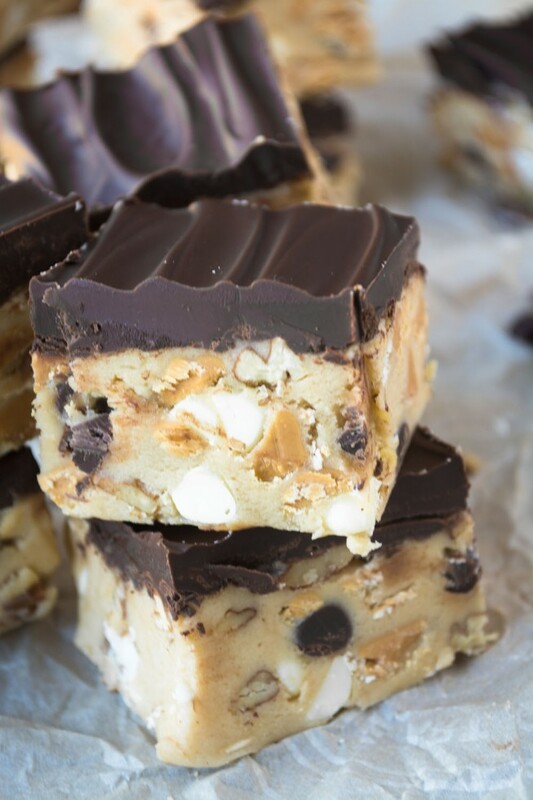 I have made your “original” cookie dough bars several times since you first shared the recipe, always to rave reviews. From my grandson: “Nonna, these are the best things you’ve ever made!” From my husband: “You know those no-bake cookies you make sometime? Don’t make them anymore. These are my favorite.” The last time I made these (yesterday) I did have the thought of vanilla chips and nuts. Next time. Maybe tomorrow. Wow these look amazing! 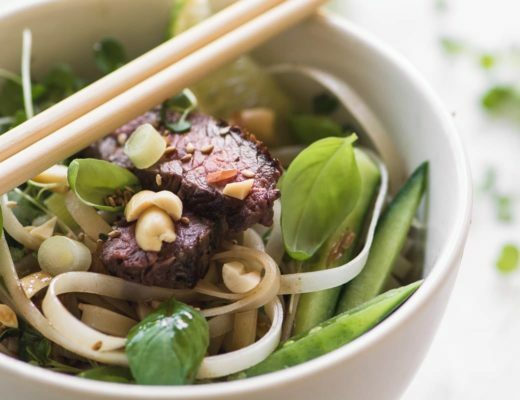 Can you leave out the condensed milk or substitute it with something else? Feels like the bars can be a tad too sweet and would love to make these without so much of the sweetness since there’s 3 different sweet chips going into the batter plus the choc frosting already. Thank u! I don’t know of a substitution offhand, Diana, but I think you could use less of it, if that helps. My mouth is watering just reading through the list of ingredients. Peanut butter chips…I want SOME! I hate to say it but clinical studies have shown that 13% of flour is contaminated with E. coli bacteria. Yes, the flour. So some manufacturers who sell raw cookie dough to be baked at home are now pasteurizing the flour as well because people tend to eat the cookie dough raw. People think that the contamination comes only from the eggs but many eggs are pasteurized now. It is the raw flour that is the danger! Pamela —you may be bringing this up due to an isolated incident linked to store-bought, ready-to-bake cookie dough products. I think that if you purchase quality ingredients and follow safe handling practices in your kitchen that can be found here: http://www.fsis.usda.gov/…/basics-for-handling…/ct_index, that raw flour is no more dangerous than any other raw food product, be it meat, flour, or even fruits or vegetables. You can alleviate these concerns by toasting your flour first by spreading it on a baking sheet and baking it at 350ºF for 4 to 5 minutes. What a brilliant, fun idea. If you Fed Ex a box of these to North Carolina I will consider marrying you or at least being BFF :) They look amazing Sue. Thanks for the link! 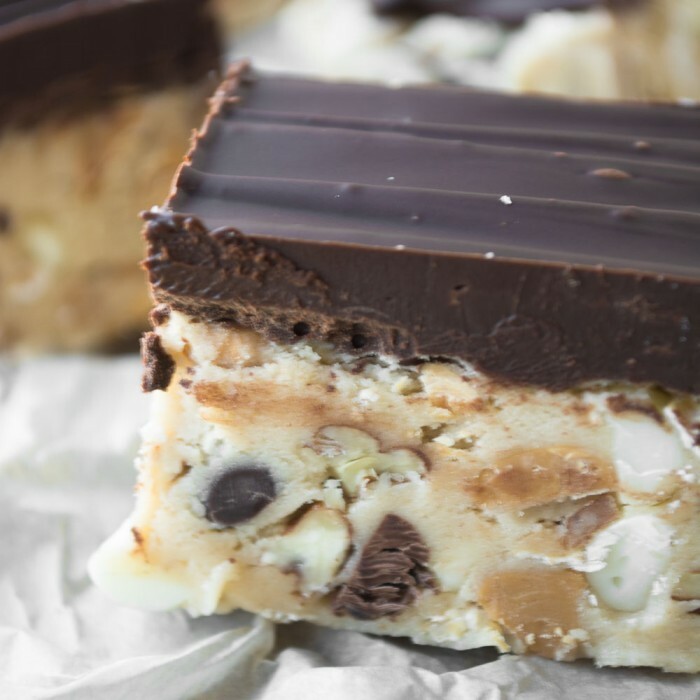 There really isn’t anything more delicious than a bar chock full of delicious ingredients. And a cookie dough bar? Soon to be everyone’s favorite dessert recipe, no doubt! 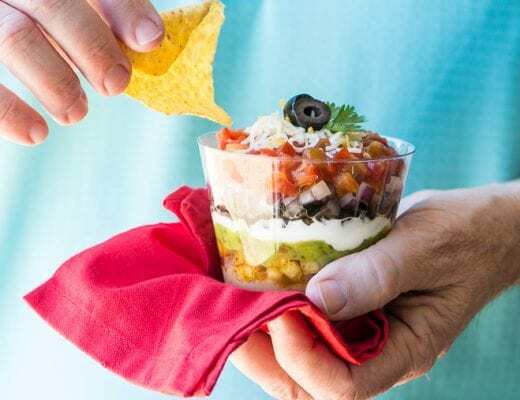 Hi Sue, here you go again………these are perfect for summer or really anytime of the year, love that they are no bake!!!! You forgot to add the chips & nuts in your instructions. I added them after mixing dry ingredients and condensed milk. Can’t wait to try them with the chocolate layer (in the frig now!). Sampling the bits that didn’t make it to the pan were yummy! Thanks Karen, I’m in summer la-la land! Just fixed it! So you’re telling me that if I make these bars, I might get a few more marriage proposals than I’m currently getting (which would be zero)?! Sign me up ;). My mouth is watering! These sound spectacular. Maybe hubby would marry me all over again. Well. I best not overthink this! Wow, these are loaded with great flavor and good looks! Terrific bar — need it. Now. ;-) Thanks so much. The perfect answer to a cookie-dough craving, with a chocolate layer to boot! I didn’t think of that, these do have that extra perk!